Do I see the irony that I have writer’s block and yet am the main author of a blog? Yes. Has this process been at all humorous over the past few weeks? No. Humor has always been my way of dealing with uncomfortable situations, or coping with things that I would prefer not to deal with, so I figured I’d go back to the basics and give it a whirl. I’m a big fan of going directly to the source when trying to solve a problem. Since every time I have sat down to write something, my mind draws a blank, then perhaps I would write about the issue itself and hope something interesting morphs from the process. 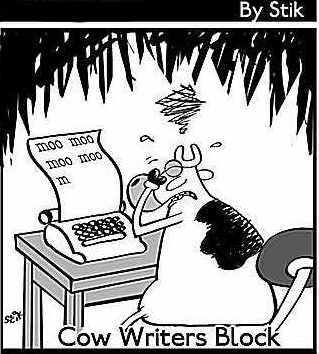 Though this post is directly targeted towards laughing at, then trying to get over my “writer’s block” I would assume that everyone, at some point in their life goes through a “block” of sorts. Whether that is in their personal lives and they are at a crossroads that needs a drastic overhaul, or in their career when they find that they have lost their love for what they are doing. In the end, I feel much better even after this simple “process” of making fun of myself for “suffering” through this “affliction.” Hopefully if any of you are going through a “block” in your personal or work life, perhaps it would be helpful to stop analyzing every single inch of the issue…and just try and laugh it off and move forward…?